In the 1970s London was invaded by American hamburger restaurants, and I'm sure many baby boomers of my age have fond memories of eateries like the Great American Disaster. 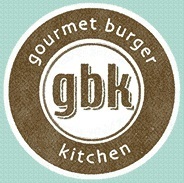 Nowadays my favourite burgers are from the Gourmet Burger Kitchen, or gbk, a chain of restaurants conceived by three New Zealanders. 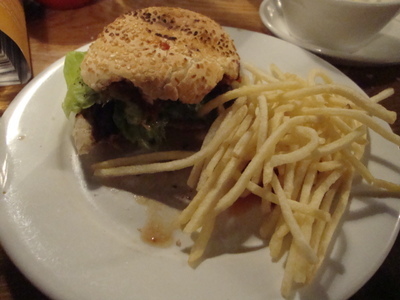 However they don't just serve beef burgers, but also cater for those who prefer poultry or are vegetarians. They aim to satisfy huge appetites with their double patty, The Mighty, but also cater for those of us who are less hungry or who are watching our waistlines. The menu has additional choices of both smaller burgers (as an alternative to the originals), and bunless offerings. Their big fat chip shop type fries have also been augmented with super skinny chips, truly the thinnest fries you have probably ever eaten. The food is cooked freshly to order; the beef is 100% West Country beef and the meat for the Buffalo burgers is sourced from Laverstoke Park in Hampshire and is completely organic. You can pad out your meal with extra toppings, salads and side dishes, and even nibble at complementary monkey nuts while you wait. Hot and cold drinks, including the thickest milkshakes, are available. (Trust me the chocolate one, complete with chocolate chips, is to die for.) They are licensed to sell wine, beer and cider and offer a junior menu without a chicken nugget in sight. They are an altruistic company and both work with, and support charities. Trust the Kiwis to donate a share of their profits to Capital Radio's Help a Capital Child and to donate money from the sale of their Kiwiburgers to their adopted kiwi, Aotearoa, otherwise known as Beetroot. Since the first branch opened in Battersea in 2001, gbk has spread across the UK, so you are never very far away from a good burger, especially in the London area. Their food is available for either eating in or taking away. Please visit this WeekendNotes article for more information on where to find the best burger joints in London. Why? To spoil yourself with healthy fast food. Where: Check the website for your nearest branch. Cost: The Classic Burger costs £6.55 and The Mighty is £11.95. Extras and drinks are available, and the Junior Menu is £6.50, including a drink.